Abbott must be having a horrible Christmas break. He can’t have missed that his old buddy, his mentor Rupert has completely dropped him and in doing so, has given permission for his newspapers to admit that PM Abbott is a dud. They’re still not yet ready to admit he’s always been a dud and that they were stupid to support him in the first place (as if they’ll ever be ready for this sort of atonement), but they’re willing to go as far as actually reporting his poll numbers, which speak for themselves, and saying that if only he could get his ‘message’ right, their neoliberal Tea-Party agenda would be gratefully accepted by the electorate instead of wholeheartedly rejected. It’s fascinating to watch an entire news organisation finally coming round to the fact that the public knows better than they do whether someone is a good PM or not. I thought the whole definition of ‘news’ was telling us all something we didn’t know, and being first to the story? Abbott’s incompetence is old news, and News Ltd coming to this realisation last is really the only thing you need to know about the incompetence of News Ltd. ‘Oh Abbott’s polls are bad!’ they all cry in unison! ‘We totally didn’t see that coming!’. So what are News Ltd going to do now that their favourite son has spectacularly failed? If you’ve been paying attention to the number of puff pieces being written at News Ltd about their chosen successor, Julie Bishop, you will see that a Libspill is clearly being planned. As soon as I realised that Julie Bishop was being put forward as the most likely replacement for Abbott, I realised just how screwed the Abbott government is. Because if Bishop is deemed as the ‘best performer’, it shows just how badly the rest of them have performed. Think about it for a second. What exactly has Bishop done which is so high performing? Perhaps if the definition of high performing is ‘not stuffing up as badly as the rest of the Abbott ministry and being protected by News Ltd so even if you did stuff up the public never heard about it’, then Bishop has been high performing. But all I’ve seen is very basic no-more-competent-than-you’d-expect-of-an-average-politician-statements from her in response to international tragedies, such as disease, terrorism and plane crashes, and of course I’ve seen her slashing the Foreign Aid budget, making Australia the stingiest rich country in the world, bar none. I can see that News Ltd are clearly happy about this, but as I’ve said previously, News Ltd’s opinion and the general public’s opinion do not match and are increasingly at complete odds so News Ltd being happy about something more than likely works against Bishop in the long term. But even more interesting than the claim that Bishop is ‘high performing’, is News Ltd’s strategy of backing a female Prime Minister, after systematically mauling our first female Prime Minister, Julia Gillard, with a sexist, low-life, scum-filled campaign of hateful lies and misinformation. Just to remind you all, Julia Gillard was the most successful Prime Minister this country has ever had. You won’t ever see any such analysis done in News Ltd papers, but this Guardian article has run the figures showing Gillard as the winner. So keeping this in mind, and keeping News Ltd’s vile anti-Gilllard campaign in mind, how are News Ltd going to position Bishop, a female, unmarried, childless ex-South Australian lawyer as PM material, when they so blatantly positioned Gillard as unfit, whilst appealing to the scum who read their newspapers, who were only too happy to agree? They built the anti-female-leader narrative, so how are they going to tear it down in support for Bishop? So far, I have seen three strategies at work. Clearly Bishop thinks she is Hollywood and is a celebrity and that’s the end of that. The second strategy to ready Bishop for the position as Australia’s second female Prime Minister is for her to paint herself as not a feminist, and not as having benefited from feminism to get where she is. It was all her, apparently. And women who think they need feminism to get ahead need to stop complaining and get on with it, apparently. I feel that Bishop claiming she’s got where she is without the help of the feminist movement is akin to the captain of a football team being presented with the Grand Final cup and saying ‘thanks so much for all the applause. Clearly I played really well and that’s why the team won. I don’t know what all those other guys on my team were doing, but without my individual effort, the Grand Final cup would not be mine today’. Feminists have every right to be offended by Bishop’s suggestion that their hard fought battles are just a campaign of whinging. And of course they have every reason to laugh at Bishop, who is one of two women in Abbott’s cabinet, after being the only one for the first year, presumably because all the other Liberal women of merit were too busy complaining instead of being merit selected in a cabinet that is full of un-merit-worthy men. You’ve got to laugh so you don’t cry! ‘Dignified yet determined, Ms Bishop has succeeded where Julia Gillard failed, by showing that women can perform at the highest levels of political office without either hiding behind their gender or sacrificing their femininity. A passionate advocate of women, Ms Bishop believes in merit-based promotion, and her own hard work is now reaping rewards, both on the international stage and in domestic polls. And the damage done by Ms Gillard to the public perception of women in leadership roles is slowly being healed as voters regain confidence that a female politician can deliver’. So this is the campaign and it’s well underway. There’s no sign yet as to how News Ltd will deal with Bishop’s embarrassing past of plagiarism, or her seedy career as a lawyer fighting against asbestos victims, and apparently once asking ‘why workers should be entitled to jump court queues just because they were dying’. But we will watch and see as News Ltd comes up with new techniques of dishonesty to repel any criticism of their new-found-favourite candidate. And of course, it will be fascinating to see how such a leadership spill could possibly be orchestrated without use of the words ‘blood’ and ‘stab’ littered throughout the reportage. No doubt that’s the last piece of the puzzle that needs to be worked out before we wake up to find Abbott gone, and PM anti-feminist-pro-Armani-asbestos-Julie in his place. 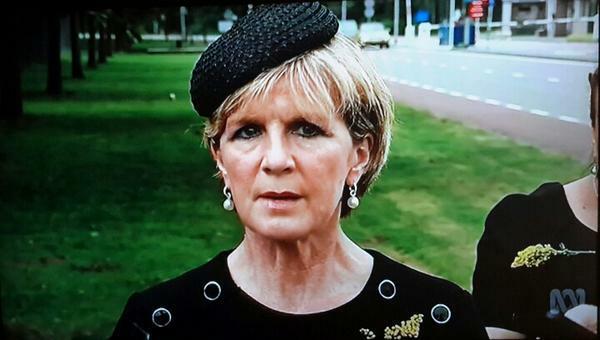 Asbestos Julie is simply a moving chair on the Libtanic. The iceberg of public opinion has already struck! And there are not enough lifeboat seats for all those aboard! Well can anyone equal Abbotts record. Born in England and still retains English citizenship not revoked and disqualifies him for P.M. Gained an Oxford University blue for punching people up, Punched a hole in a door at a N.S.W. university just missing a female student. Became a trainee catholic priest but got kicked out as he could not handle discipline and broke rules. Appointed a manager of a concrete company and was sacked for his attempt to bully and harass the staff. Became a writer at the Bulletin and was dismissed for incompetence. Joined Hewson as a speech writer but was soon dismissed as useless. As health minister ripped a billion out the system. Now as Prime Minister you know the rest. I agree that tony (I refuse to capitalise his name as I was taught to use capitals for Proper Nouns and I find nothing proper in this person!) is a total incompetent and a born to rule loser. However I do not think that assassinating tony is the way forward for his party. They need a new election asap! Excellent resume about Abbott’s life and should be posted worldwide, just encase someone wants a bully boy politician for free. On a more serious note, I foresee a lot of problems for male writers and bloggers in dealing with Ms Bishop. It will be hard to criticise her in the same was we have become used to criticising tony. Budgie smugglers are a fair target for all writers but padded shoulders, if targetted, will be rightfully seen as a sexist snipe. As a blogger I am not looking forward to her leadership. Just compare Bishop with Julia Gillard’s achievements and you will win hands down. Pretty good piece, I thought. Excellent open letter Victorian. Thus rounding off a well document and beautiful written literature for years end. Happy New Year to all. A very interesting piece. I would be most interested to see how a coup can be pulled off without Ms Bishop having blood on her hands if it happens. Personally I think that what the Libs need are new policies otherwise it’s the same bus with a different driver. I must say that since early December I have enjoyed more & more each day reading the blogs at The Australian (Yes I am a subscriber, I like to read widely) The Abbott boosters have become more desperate, more strident & more abusive as the days go by. They are well aware that The Oz has changed horses in the electoral race. When they started accusing the Oz of being a haven for “lefty journalists” & Labor propaganda I realised that the jig was up for Abbott. I haven’t had so many laughs since…..I don’t know when I have had more laughs. It is worth every cent of my subscription. You’re good Victoria. Very very good.